78 percent decline of plastic bags in waste collected from Seattle after that city banned them. OLYMPIA – Everybody wants to cut down on plastic pollution in the oceans, but opponents of proposals to ban plastic bags and straws say it might not be that simple. Such a ban would be a huge step forward for the environment and public health, said Bruce Speight, state director of Environment Washington, a Seattle-based advocacy group. “Nothing we use for a few minutes should be allowed to pollute our oceans and rivers, and threaten wildlife for centuries,” Speight said. Americans use more than 380 billion plastic bags each year, the Environmental Protection Agency estimates. Plastic components are found in many types of marine life and kill as many as 100,000 sea mammals each year, according to the United Nations. Plastic bags already are regulated in 27 cities in Washington, but Ellensburg is the only city east of the Cascades. The bill would provide Spokane and other inland cities with cleaner air and water, said Sen. Andy Billig, D-Spokane. Film plastic, the type used in plastic bags, made up about 6 percent of Eastern Washington’s waste stream from 2015 to 2016, according to a Waste Characterization Study from the Washington Department of Ecology. Total plastic accounted for more than 12 percent, or nearly 90,000 tons, of the East Side’s waste. Under the proposal, customers could purchase paper or reusable plastic bags for a dime each. Cities with a bag ordinance already in place would be required to adopt the state’s bill by January 2020 but could charge a higher bag fee. The fee would raise customer awareness and encourage them to reuse bags, said Rosauers Chief Executive Officer Jeff Philipps, whose company supports a statewide bill. “In charging the consumer for that cost differential, it really encourages the use of reusable bags, which is something our industry has been promoting for quite some time,” Philipps said. The fee also would help stores offset the added cost of paper bags. A paper bag costs the store 12 cents, compared to 3 cents for plastic, he said. Although Rosauers doesn’t have a figure for total number of plastic bags its stores use, Philipps said at one location, where customers opt for plastic bags 74 percent of the time, the cost to replace them with paper bags could be $85,000. Spokane recycling centers will not take plastic bags because they clog machinery and cause work delays, said Kris Major, education coordinator at the City of Spokane Waste Department. Officials started a “Ban the Bag” program county-wide in the fall of 2018, in an effort to keep plastic bags out of recycling bins. Besides offering customer the option of using paper or plastic bags, Rosauers also provides a place where customers can return their plastic bags to “recycle” them. But it doesn’t appear that those bag get recycled. Rosauers sends its plastic bags to Waste Management with the rest of their recycling, such as cardboard, Philipps said. Waste Management, which partnered with the county as part of the Ban the Bag program, does not accept plastic bags, said Steven Gimpel, Recycling Education and Outreach Coordinator at Waste Management. Plastic bags that Waste Management collects are exported to the city’s incinerator. Plastic bags that wind up in the trash in the city of Spokane are burned and converted into steam energy at Spokane’s Waste to Energy Plant, Major said. Of the 15,000 pounds of litter collected along one urban section of the Spokane River, about 30 to 50 percent of it was plastic, said Spokane Riverkeeper Jerry White. Microplastics were found in nearly every sample of water collected from the river, he said. Since there is no optimal solution for plastic bag disposal, “let’s simply not make them and let’s use alternatives,” White said. 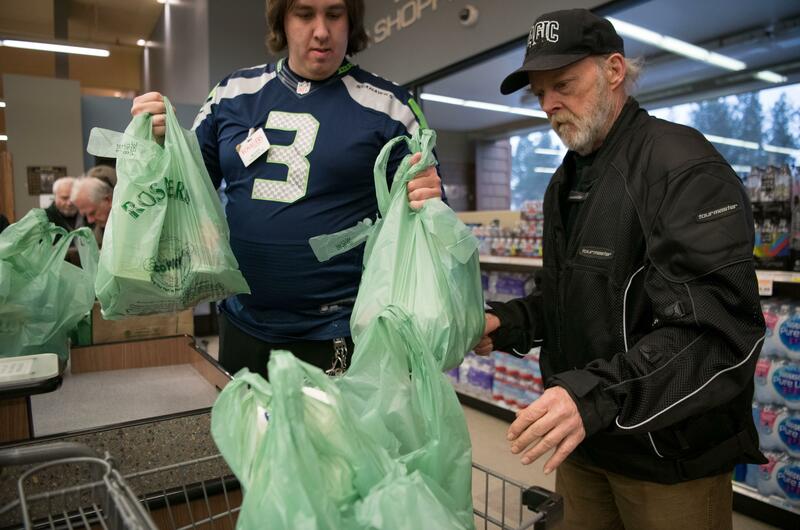 Seattle, which started its bag ban in 2012, has seen a decline in plastic bag waste, according to a 2016 report from Seattle Public Utilities. Plastic bags in residential garbage were cut nearly in half, and bags in waste streams declined 78 percent. But paper and cloth bags come with their own environmental concerns, critics of the proposed ban said. Plastic bags are reused for other purposes, said Todd Myers, of the Washington Policy Center and the Puget Sound Salmon Council. The ban would replace plastic bags with less environmentally friendly options, he said. “I think we should do our part to reduce the impact on the environment, but we need to make sure we don’t do more harm than good,” Myers said. There are always tradeoffs when you move from plastic to paper and cloth, said Dr. Rafael Auras, an associate professor at Michigan State University’s School of Packaging. Paper bags generally have less global warming impact than plastic bags, Auras said. The trees grown to make paper bags capture carbon, while burning plastic releases carbon, he said. But paper produces more water pollution and is heavier than plastic, making it less efficient to transport, he said. Cloth bags are the most resource-intensive option, and consumers need to use them at least 10 times to offset their environmental footprint, he estimated. People who buy reusable cloth bags also tend to acquire more than they need, which reduces their conservation potential. Regardless of the type of material used, consumers should use bags the maximum amount of times and dispose of them properly, Auras said. There is no perfect solution, and policy makers should be wary of those who offer one, he said. “If we start using that information, we can make policy decisions that are meaningful and that are directed to minimize our environmental footprint,” Auras said. The bill would allow stores in areas without an existing bag ordinance to provide plastic bags from their inventory until next January. Retailers would not be able to waive the charge except for customers with an electronic benefits card. The Senate Environment Committee also is considering a plastic straw ban, which would prevent restaurants and stores from providing or selling plastic straws. They could provide straws made of paper or some other substance, or a lid that doesn’t require a straw to drink. That bill, which the committee has heard but not yet voted on, would require the state to work with community health groups and disability advocates, who testified to the committee that they weren’t consulted about the proposal. An outright ban would limit access for some people, said Aimee Champion of Self Advocates in Leadership, a Washington group that advocates public policies affecting people with developmental disabilities. Straw alternatives are great for many people but not for all, she said. “The only thing that fully accommodates everyone, without question, is a single-use plastic straw,” she said. Holly Chisa, who represents the Northwest Grocers Association, suggested plastic straws could be available on request for at least a year while alternatives are phased in. Metal, paper and plant materials like corn often are used in alternative straws. These options are less maneuverable and dissolve easier, and many people are allergic to their components, said Shaun Bickley, of the Arc of King County. He criticized the bill for stipulating that the state would have to work with disability advocates after it became law. “Name dropping the disability community doesn’t mean anything if you’re not going to listen to us,” Bickley said. Straws aren’t as big of a problem for ocean pollution, Bickley added. According to a study in the journal Science, plastic straws make up 2,000 tons of the 9 million tons of plastic in the ocean. Customers asked about the bag proposal outside the Yoke’s Fresh Market on North Foothills Drive had mixed responses to the idea. Yoke’s, like Rosauers, allows customers to choose paper or plastic bags. Cooper said she believes most the plastic pollution in the ocean comes from China and other Asian countries. “It’s the environmentalists trying to control everything,” she said. Wayne Richardson picked a paper bag to carry his groceries because he reuses the bags for trash. He supports the bill, he said, citing the need to clean the environment and prevent animals from consuming the paper bags. As for the 10 cent charge on paper bags: “A dime is not much,” he said. Leah Fitzgerald chose plastic bags at the checkout, but said she supports banning them. Fitzgerald is from Hawaii, where a similar ban exists, and she remembers people being “up in arms” when it was approved. But feelings shifted, she said. Reporter Will Campbell contributed to this report.